Though bottled hot sauces can be obviously convenient, making your own hot sauce gives you more choice. You can tailor the sauce to your family's needs with subtle hints of heat to off-the-charts. And when you're blending up your own batch you know exactly what's in the bottle and how long it's been there, so your sauce is always fresh. 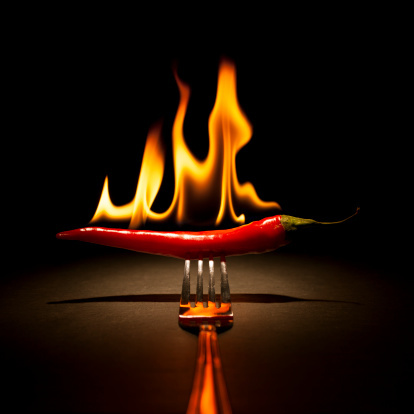 The best hot sauces have layers of flavor, depth and a heat that lingers on the palate like a lover's kiss; hot but not scorching to the point of discomfort. This recipe uses the Trinidad Scorpion Moruga Yellow, 7 Pod Brain Strain Yellow and 7 Pot Jonah for that extra kick. Lime juice, ripe mango, spices and fresh herbs round off a hot sauce that's pretty much picture-perfect when it comes to adding a hit of sabor to grilled fish or chicken. Bonus; there's likely enough left over to gift to your culinary BFFs. So grab a few bottles and get cooking! Wipe all your chili peppers with damp cloth to clean and place them in hot cast iron skillet (on high heat) until they slightly blister and are fragrant, turning them regularly for approximately 2-3 minutes to avoid burning. Remove from pan, set aside and let cool. In the same pan, dry roast your skin on garlic cloves for a few minutes, making sure to turn so they get evenly blistered. Once blistered, remove from heat and let cool. Place in bowl all your chillies and cover with boiling water. Set aside. Remove skins from garlic. Drain water from chiles well and place all chiles and garlic in a blender or food processor. Add vinegars, lime juice, salt, cane sugar, and cumin. Pulse until combined. Add oil, mango, and fresh herbs. Blend until smooth. Adjust salt to taste. Three Chile Citrus Hot Sauce uses the flavors of Hot chili peppers. Lime juice, juicy ripe mango, spices and fresh herbs to round off a hot sauce that's pretty much picture-perfect when it comes to adding a hit of sabor to grilled fish or chicken. You can replace your dried chili pods with chili powders. 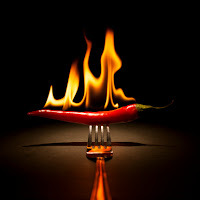 www.firehousechilli.com for all your hot chili peppers.